Yoruba lifts the ropes and invites Jocelyn, a new sparring partner for his daughter, into the backyard boxing ring he has built. She steps inside the ring, and moves around it to get the feel for the surface. She’s ready to go. Yoruba’s daughter Sharahya-Taina Moreu is being attended to by a sibling. Gloves are tightened, head guard cinched up in preparation for sparring. Both women will compete this March in the 2018 Western Elite Qualifier. Ring experience with another competitive fighter of a similar height and weight is invaluable. Bold and brash reggaeton from Yoruba’s native Puerto Rico fills the backyard, and everyone seems to relax, swaying a little into their hips. The bell rings and the two women get to work, trainers and friends recording the rounds with phones and tablets lifted. This is a normal Saturday’s sparring at the Moreu household, where Yoruba trains two of his children and three other local amateur boxers, six days a week. Sharaya, the eldest of the children, stands an impressive 5’10”. On social media Sharahya goes by @PuebloRican, a reference to her heritage. Her mother was of native descent from the Acoma Pueblo and her father, a proud Puerto Rican. Despite the humble setup, this family puts in the work and gets results. 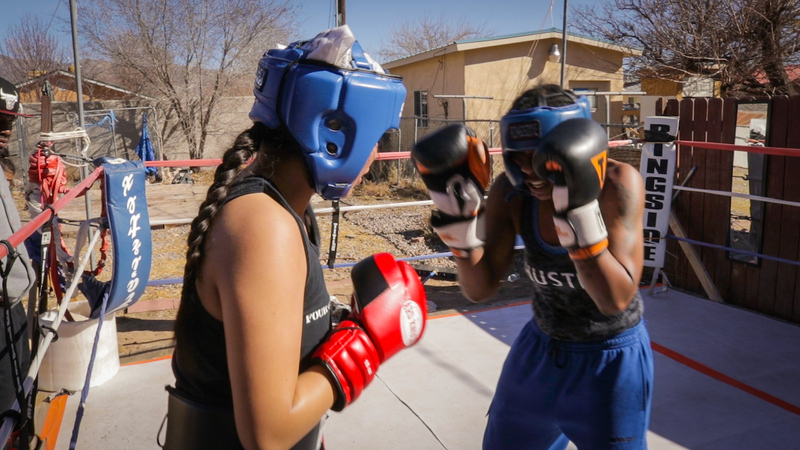 Sharahya, who began boxing at 12 has 9 national titles, over 50 amateur fights, and last December participated in the Women’s Youth World Championship in India as part of Team USA. Now at 18, she has graduated from the the youth squad and wants to claim her place on the adult or ‘Elite’ Team USA. However the floor for her, has opened up to fighters of all ages. “It’s like stepping out of high school or something, going into the real world,” Sharahya says. “Normally you’re fighting younger kids, but [now] you’re fighting older people, people who could be like, my mother.” She mimics shock and laughs. With less than a week until the Western Elite Qualifier, its second consecutive year in Albuquerque, amateur fighters and fans have good reason to be excited. “If you want to be on the US team this is the best tournament you’re going to see,” she says. “You’re going to see the best of the best. You can expect everyone from the West to the East Coast. Everybody from 8 years old to 35, and up because now they’re having the Masters Division.” She refers to the first Masters Open, a division for older boxers created due to popular demand. Sharahya will need to place in top two in her division to qualify for the Nationals later this year. When Sharahya was small, she often accompanied Yoruba to the gym. Sharahya’s first experience of boxing was intended as a punishment. Sharahya had been getting in trouble at school. Yoruba was upset that she was fighting on school premises. He put her in the ring with a 25-year-old, thinking she would quit and learn a lesson. Sharahya remembers it. Seeing her commitment for the sport, Yoruba built the home boxing gym, and their small team now includes Sharahya’s brother Yoruba Jr. and three other local boxers. Despite losing to the top seeded Russian, she is full of gratitude for the experience. The goal is the 2020 Olympics, but a professional career also beckons. Yoruba is patient. Although this journey is a passion for both Sharahya and her father, there have been hard times and compromises. 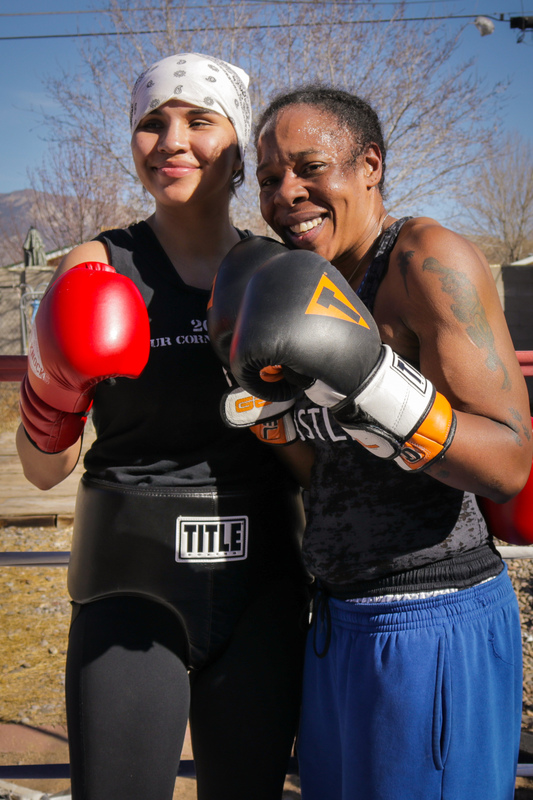 You can support Sharahya and the flourishing amateur boxing scene at the 2018 Western Elite Qualifier and Regional Open Championships taking place at the Albuquerque Convention Center from March 6th to March 10th. Entrance is free for most of the even except for the finals on Saturday the 10th which are $10 per person.